Is FX CHOICE one of the best Australian Forex Brokers? We conducted an in-depth review in April 2019 to find out the answer and bring it to you! FX Choice Limited was established in 2010 and is headquartered in Belize City, Belize. It is a pure NDD (no dealing desk) broker that provides tight spreads in a stable, safe and secure environment. Over the years, the company has received awards for multiple services, including their great customer service offering. FX Choice Limited is regulated and authorised by the IFSC (International Financial Services Commission), which guarantees a solid regulatory framework. The company focuses on the security of client funds in particular with a mission to provide a safe and reliable trading environment. The in-house Risk Management department ensures compliance in every area of the business and thoroughly monitors every type of operation. As is true for all brokers, clients pay either a spread or commission on every non-share CFD. FXChoice doesn’t offer the widest range of available markets, but its trading conditions and environment are great. As an example, this broker offers ultra-low spreads, starting from 0.0 on Forex pairs. Clients can choose from 10 CFDs, including the USTECH Index, Wall Street 30, UK 100, Germany 30 and WTI Crude Oil. As an example, the margin per contract starts from 2,214.90 on WTI Crude Oil. With FXChoice, traders can select from two of the most popular trading platforms available on the market: MetaTrader4 (MT4) and its younger brother, MetaTrader5 (MT5). Both platforms are available on almost any device, be it desktop computers, Android or iOS, and can be utilized with both the Classic and Pro account types. Fans of copy trading can take advantage of the popular Myfxbook AutoTrade platform, an online automated analytical tool that allows users to connect to the first-ever large social and copy trading community. MetaQuotes provides a unique service called Trading Signals, which allows clients to shadow the trades of seasoned trading veterans (Signal Providers). This service can easily be installed into an MT4 account and works very well alongside other EAs or a trader’s own trading strategy. This service is especially beneficial to clients who are new to trading. FXChoice also offers a free VPS (Virtual Private Server) to any client who has an account balance of $3,000 or more. FXChoice offers award-winning 24/5 customer service with a team of customer success managers that can be contacted via Live Chat and telephone. 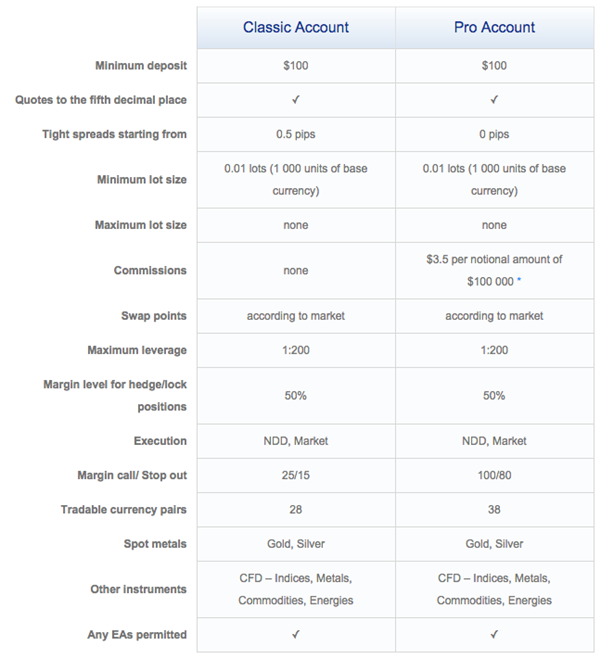 FXChoice offers two different trading accounts with different benefits. The best fit depends on what you, as a trader, are looking for. If you are rather new to online trading, you might want to get started with an account that features $0 commission, or perhaps you might be interested in ultra-low spreads from 0.0 pips. High volume or institutional traders are also very welcome and can benefit from FXChoice’s “Pips+ for Pro accounts” offered on both MT4 and MT5. This program allows highly active traders to reduce their trading costs. FXChoice offers ultra-low spreads, starting from 0.0 Pips on the Pro account option. The Classic account comes with starting spreads from 0.5 Pips. Leverage can be set as high as 200:1 and the minimum deposit size is $100 for both account types. There are up to 38 tradable Forex pairs with a Pro account (versus 28 with a Classic account) as well as 2 spot metals, Indices, metals, commodities and energies CFDs. FXChoice offers ultra-tight spreads starting from 0.0 Pips (on a Pro Account). Clients benefit from a strictly NDD (no dealing desk) broker. Decent leverage of up to 200:1 is available in a safe and stable trading environment. MT4 and MT5 trading platforms are available. Myfxbook AutoTrade is available for traders who wish to connect to a social trading network and use copy-trading strategies directly with their FXChoice account. MetaQuote trading Signals are available on MT4. FXChoice allows most trading styles, such as Expert Advisors (EAs), scalping and hedging. Pro accounts offer lowered commissions for high volume traders or large equity accounts. FXChoice overall offers a very professional trade environment and a great customer service presence. Decent leverage and a good selection of tradable instruments are available. Institutional and high volume traders await excellent benefits and extra features worth checking out!